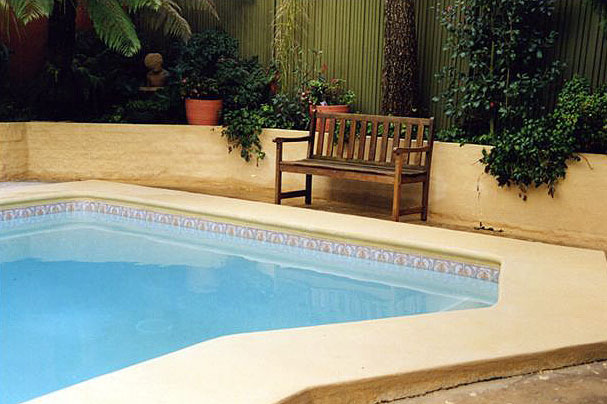 Many pools in Australia are finished with Marblesheen (Marblelite), especially those constructed in the 1970’s to 1990’s. It has since been over taken by other trowel on finishes like Quartzon. 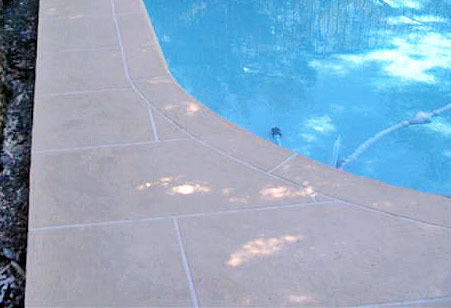 Marblesheen is mainly a mix of white cement and crushed marble (chips about 1 – 3 mm size) that is trowelled onto a concrete pool structure in thickness from 5 to 20 mm. The finish initially would have been smooth and white. The quality however varies as it is a hand applied finish and the skill level of the installer will impact on its look and longevity. Over the years and depending on the quality of installation, pool water chemical balance and general wear and tear, it will slowly degrade. Usually is ends up with random cracks, worn areas, black staining and may be rust staining too. There can be large areas where the Marblesheen is soft and weak. Some areas may be drummy (hollow underneath) or break away completely. There may be white calcium build ups as well. Older pools often become hard to keep clean, with algae attacks common and particles of Marblesheen getting stuck in filters. Marblesheen can be upgraded with Epotec to provide a new long lasting easy clean finish so long as some careful checking is done first. Empty pool and look closely at surface. Check for drummy and soft / weak areas – remove & replace.